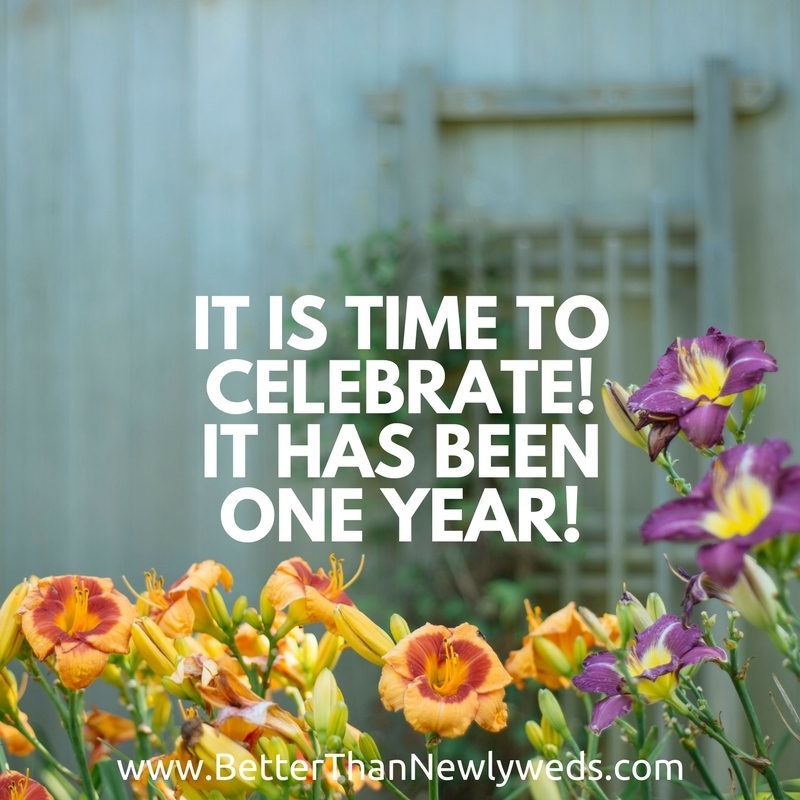 It is time to celebrate! I struggled for the longest time to write on a regular basis. It wasn’t until I finally was obedient to the call to write from God that I was able to do it. It has been one year since I wrote about how God called me to write. I was looking back over the posts I’ve written in the last year and thought sharing a bit from the top 5 visited posts would be a fun way to celebrate all that God has done. God has really used the verse to help me show me that Love is not just some mushy gushy feeling we have. Love is a choice. Love is hard work. Love is worth it. I have learned how to apply this to my marriage more but He has also shown me how to apply this to other relationships as well. Love makes all the difference. I was very surprised when my post on reviving the intimacy on your marriage became the second most read post in one day! It just showed me how much people want to keep their marriages strong. Intimacy in a marriage is so important. Just like it is in our relationship with Jesus. If we do not make time for alone time with Him our relationship with Him will suffer. If we do not make intimacy with our husbands a priority our relationship will suffer. I know that at the beginning of our marriage I left more sweet notes for my husband. I know we both did more thoughtful things. It is not that we care any less about each other now… it’s just our minds are consumed with other thoughts. And even though they are good thoughts, mostly about our daughter, it affects our intimacy. I want our daughter to reap the same benefits I am because we decided to invest in our marriage. I want us to be better than when we were newlyweds. That isn’t just some cute name I came up with for my blog. It is the cry of my heart for our marriage…for every marriage. I can leave more notes. I can make more of an effort. I think we all can. And I think it will be worth it. The devil has no new tricks. He will do whatever he can to cause division and separation in your marriage. We knew this was true for our marriage as well. We want to do our best to prevent any division in our marriage. This was very important to us. It is important to all my BTN readers as well who made “Can we affair proof our marriages?” the 3rd most read post. My husband and I have had a conversation about “affair proofing” our marriage. We talked about ways we could protect ourselves from going down that road and eventually falling off the cliff that is surely at the end. One thing we decided was that we always need to be open with each other. This means that our phones, email accounts, and bank accounts are an open book. This is one of the many reasons we have a shared bank account. We are one… and we try to live in a way that keeps us together as much as possible. Over the past year God has taught me a lot about how, if we are not careful, we can let past hurts affect present relationships. This is not how God intended it to be. In our marriages God wants us to be free to be who we are and able to grow. This means we have to trust our husbands. Trusting our husbands is hard if we are holding on to past hurts. The same applies to our friendships. If we’re honest about past hurts (4th most read post) I think we all would have some changes to make. The devil has no new tricks. I find myself saying that a lot lately. But it is true. He is always trying to cause strife, division, doubt, and anything else that will keep us feeling defeated. The devil wants to keep you feeling defeated (5th most read post). If he can keep you feeling defeated he can keep you from doing all that God has called you to do. Don’t let him. Press in and pray and serve God anyways. Life is too short and God is too big to give the devil any help in keeping us feeling defeated. Because of Jesus’ death on the cross and resurrection from the grave the only one who is defeated is the devil! We have to recognize that and walk in victory daily or we help the enemy with his plan to keep us feeling defeated. I said “feeling defeated” because it is a mindset. If we are in Christ then we already have the victory. The devil knows that but he is going to do all he can to make us feel like we are defeated. We have to do all we can to remain in God’s truth so we know who He is and who we are in Him! The devil wants to keep you “feeling defeated” by condemning you and reminding you of your past. If he can keep you focused on the mistakes you made before you were “in Christ” he can keep you from walking in victory. Whatever the lie from the enemy is there is always an answer in His word.